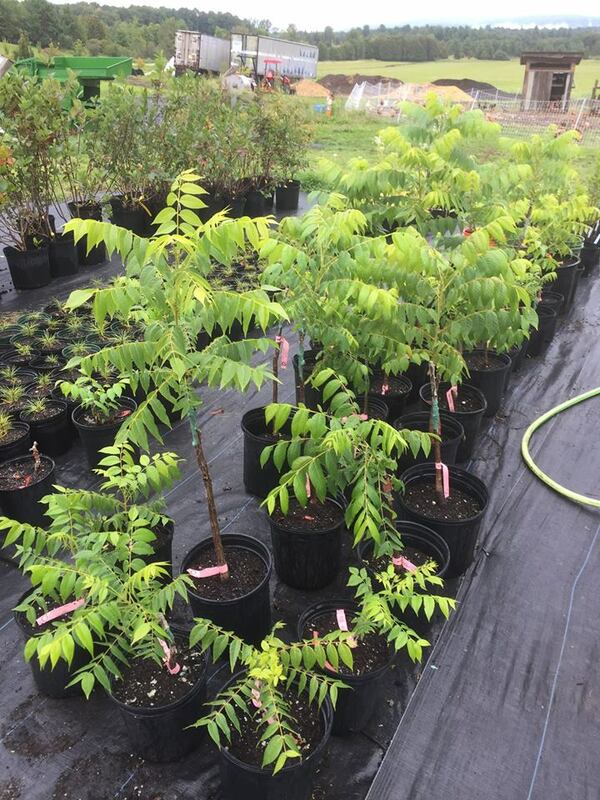 Black Locust is a nitrogen fixing plant, it fertilizes all the other plants growing nearby. it is one of the most amazing smelling tree blossoms in existence. usually they are white, occasionally pink. this row of purple flowering black locusts along my road attracts lots of people as well as bees and insects. Heartnut is a great plant to grow in cold wet Vermont. It is a very beautiful smaller, broad tree. The foliage is tropical in appearance and it is a fairly fast grower. The nuts split open along the suture lines and the heart shaped nut drops out whole. 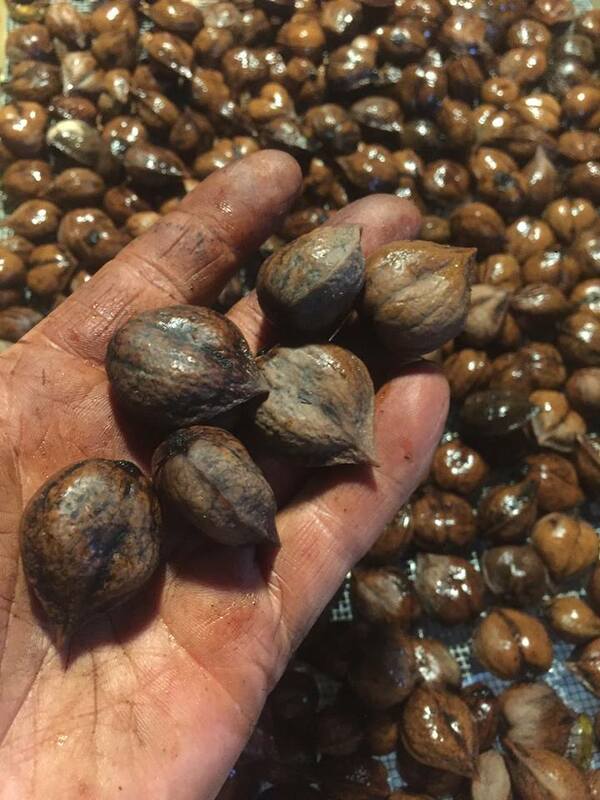 We offer grafts and seedlings of Heartnuts. The best Wild Apple i have ever found - fully russeted, aromatic pear-like, crisp clean white flesh and no sign of any disease. The 50-100 year old tree has a fabulous form, it is naturally a spreading low rounded tree. It has never been pruned, but the branching is well organized and amazingly orderly. It has big spurs and bears every year. The grafted offspring follow the parent form. A really nice plant. The first pic here is of the fruit. The tree is growing on the roadside in Cabot VT, where i have found more interesting apples than anywhere else in Vermont. Bears later in the season, the tree holds fruit until the end of November. Stores well for a month or 6 weeks in the root cellar. Good for cooking too. The second best wild apple I ever found! This apple clearly tastes of cinnamon. The tree is in Plainfield VT. This poor tree is too close to the edge of the dirt road and under the power and phone lines. As a result it has been hit by the plow trucks repeatedly, hacked back terribly by the power line crew, and generally abused. It is a vigorous grower, but seems to grow very upright. Early, it ripens after just yellow transparent, and has a similar texture, a little crisper. Beach Plum is such a beautiful and tough plant. I like to eat them out of hand, some folks find them too sharp tasting. Bears every year pretty reliably here. A great one for you fermentors to be playing with. These beautiful nuts are a likely cross of Chinkapin and Chestnut, very hardy in zone 4. This small tree is fast growing, and very productive here in central Vermont. Much faster to fruit than any other chestnut seedling I have observed. It makes sweet small nuts. It shows good blight resistance. Container grown seedling shipped bare root. Probably "Lock" shellbark hickory. It is the biggest hickory nut I have seen. I will be planting these out spring 2018 to see what the seedlings look like. This is a seed bed of hybrid hazelnuts with walnuts to the back. I love making the tree seed beds just like my veggie gardens! my wife is always wondering what beds i will usurp next. 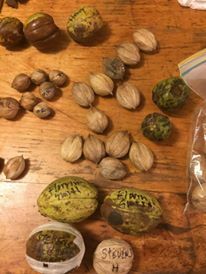 I am hot on Hicans right now, a crosses between Northern Pecan- Carya illinoinensis and Carya ovata or lacinosa, these nuts are delicious. We are growing many Hican seedlings to see what comes from their progeny. I stole the entire veggie garden in 2017 for chestnut and walnut tree seedling beds. Moving them right next to the kitchen door means i can see them, love on them and make sure they are in great shape, and watch out for squirrels. Introduced by the great nuticulturist John W. Hershey of Downingtown PA. , probably in the 1930's or 40's. This is one tasty nut. Discovered by my buddy Dale Hendricks in Pennsylvania , growing on his land. Most likely a bur oak x white oak cross. These are super hardy well rooted plants, ready to send out to your home orchard! This pear tree is about 100 years old, and grows at 1800' elevation in Zone 4a. Seems to bear every year. The plant hasn't been pruned in at least 50 years, if ever. A beautiful domed tree. We grow many seedlings of hybrids. We are always selecting from the producers of the largest nuts. Blight resistance is strong. This old place is sure fun to live with! The plants in the foreground are in the Retail area at the Farmstead. Open every weekend mid April-July. Archie Sparks was quite the Black Walnut breeder/grower. He introduced the cultivars Sparks 147, Sparks 129, Sparks 127, and Sparks MS. All great crackers with thinner shell, S147 and S127 are lateral bearing trees. This means rather than just making nuts on the tips of the terminal branches, the side branches will also bear nuts. This trait has the potential to double the nut yield over tip bearing trees. by soaking them every other day for a few hours at atime , you can get many nuts to pop open and begin to grow. I wish this was on my farm, this is one of many at the Connecticut Ag Research Station near New Haven CT. They have been treated with hypovirus to help resist the chestnut . This is how I like my Orchard beds to look. This bed of Seaberry only needs mowing once a year. All the flowering perennial "weeds" bring insect diversity during the growing season, and winter habitat for pollinators to survive the snow and cold. So many nursery plants are grown "clear fallow" nothing on the ground, and maintained that way with herbicide, irrigated and pumped with fertilizer. I do not understand how we can expect a plant raised like that to adapt to the real world without have serious withdrawl. Over the past few years i have been teaching myself to graft nut trees. It's a bit harder then fruit trees for sure. I will have lots of nut trees grafts for sale in the coming years. Pinus koraiensis. This is the tree that produces the Pine Nuts we are mostly familiar with. They are slow getting started nd grow in association with fungal mycorrhizae specific to pines. This is another Cabot Vermont wild apple tree. It is big for an apple tree. It also appears to bear every year. Because of its location on the corner of two roads, it has a reasonable chance of being a grafted tree, but no sign of any graft scar. A great multi-purpose apple. Criso white flesh, not too sweet. Keeps for a month or two. This is a pic of a nursery row from John W Hershey's nursery outside Downingtown PA. I am so amazed at the plant collection John Hershey assembled during his 40 years growing in Downingtown. His nursery is a housing development, but much of the plantings remain. Lots of our trees and shrubs are cloned by cuttings. We take dormant cuttings in the winter and make summer cuttings in early August. McAlister hican produces one if the largest nuts in North America. Likely a cross of Pecan and Shellbark Hickory. One of the tasties nuts ever. Though the nut is huge, it is often poorly filled. There is argument whether this is just the nature of the nut, or a problem with pollination. The tree is gorgeous, with dark pecan looking leaves, and quite a vigorous grower. The 90 year old plants at the John W. Hershey Nursery in PA ar 4' diameter at breast height, and 80 feet tall and wide. John W Hershey Started up the nursery program for the Tennessee Valley Authority in the early 1930's. When he left there in 1939 he took the best producing Oaks trees with him to his Nursery in Downingtown, PA. This is where they got planted. If you are into Oaks, this is a mighty resource. This Persimmon is a real find. Another plant that survived the development at the John W Hershey nursery. This one is a graft, and produces some of the largest and finest American persimmon I have observed. I will be both planting and grafting this one in 2018. It is in Zone 6 now, we will be evaluating its hardiness in Zone 4. A grafted tree planted in 1945 in Downingtown PA. Gorgeous tree and nut. A great tree for mast. A large spreading Walnut tree. The nuts are big, and crack easy. Another planting in Downingtown PA , at the the old Hershey Nursery. These are most likely Rush Hazelnut, an old variety. These thornless Honey Locust are planted savana style. The pods are filled with sweet pulp and the seeds. They make excellent fodder for livestock and sugar for fermentors. The seeds at the top are straight from the pod, the ones at the bottom are after 48 hours of repeated soaking. I treat them just like bean sprouts to get them to "pop". Another Cabot VT wild apple. Crazy looking spots. I found this one in 2016, and lost my notes to its location somehow. It was a good cider apple, sharp, and very productive. Our house is classic 1850 Vermont timber frame cape. Tough old houses built to last. We were fortunate enough to renovate the inside, insulate and replace the roof. We have great prime-ag soils right around the house, and statewide soils throughout the rest of the farm. Amazing as it sounds for Vermont we have almost no stones! Sandra and I are lucky to have these great kids helping us on the farm.